Material and methods: Twenty multiple sclerosis patients (14 female, 6 male) were involved in the study, their ages ranging from 29 to 47 years. Ten participants formed the therapy group, and 10 the matched control group matched by age, gender and the standard neurological classification scheme Expanded Disability Status Scale (EDSS). Exclusion criteria were pregnancy and mental disorders requiring medication. Patients in the therapy group received three blocks of music therapy in single sessions over the course of the one-year project (8—10 sessions, respectively). 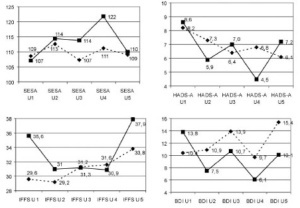 Measurements were taken before therapy began (U1), and subsequently every three months (U2—U4) and within a 6-month follow-up without music therapy (U5) after the last consultation. Test battery included indicators of clinical depression and anxiety (Beck Depression Inventory and Hospital Anxiety and Depression Scale), a self-acceptance scale (SESA) and a life quality assessment (Hamburg Quality of Life Questionnaire in Multiple Sclerosis). 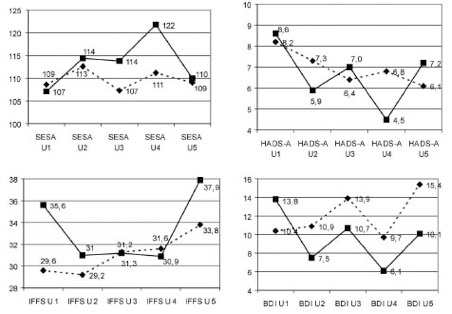 In addition, data were collected on cognitive (MSFC) and functional (EDSS) parameters. Outcome measures over time. U1—U4: treatment phase, U5: follow-up. Dashed line: control-group, full-line: music-therapy group. BDI: Beck Depression Inventory, HADS-A: Hospital Anxiety and Depression Scale—–anxiety, SESA: Scale for self-acceptance (SESA), IFFS: Incapacity and Fatigue Scale. I could not find on Dr. Aldridge’s web site a way to make contact with him as the principal author of this study to let him know I have quoted this. However, I find it interesting that with all the studies available in the literature on the effects of classical music on the brain, that no-one else has yet thought to apply classical music as a therapeutic intervention in multiple sclerosis. Unfortunately this paper does not include the details of what exactly the music therapy in the study consisted of. However, since the addition of music to an afflicted individual’s environment is low-cost, safe, and non-invasive, it seems to make sense that given the other neurological research available, persons with MS should consider classical music as a positive addition to their environment. It is clear from this study that there are significant quality-of-life improvements, which vanish when music is discontinued. And since we know that quality of life is important in many aspects of health, we should welcome any improvements as being part of an overall strategy in health care. This study is promising in another way, as well: since the effects were studied over only a short period of time, it’s quite possible that longer exposure would lead to more permanent effects. (After all, we all know what happens when we exercise or diet a few weeks, and fail to follow up!) I would love to see one-month, six-month, one- and five-year studies where the details of exactly what comprises the music therapy are made clear. In the meantime, listening and performing your daily activities to classical music can only help you, not hurt you! Dr. Aldridge, if you happen to read this, please contact me via email. This looks promising. Unfortunately, I have not seen music therapy as a treatment option for MS patients in recent years. The focus seems to be on expensive medication that helps a small percentage of patients. Unfortunately, this is true. In the United States, the focus seems to be on medication to treat symptoms. I’m not sure that medical professionals in the U.S. keep up to date on this kind of research. There might also be some bias to not believe the research, because the basis underlying this kind of study is not yet reductionistic enough for most people’s taste. And, unfortunately, there are the very few doctors who are either forced into very short appointments, and have no option but to prescribe a drug to alleviate symptoms, or are driven by incentives from the pharmaceutical industry, whose profit depends on selling people drugs, and the more drugs the better. The good news is that you don’t need a doctor’s prescription to listen to a CD or to take music lessons. While it’s unlikely today that insurance will cover the cost of music therapy, doing stretches and exercises to music doesn’t cost any more than doing them without music.